Thomas the tank engine is one of my son’s favorite characters and is always popular as a birthday party theme for young children. We decided to make this Thomas cake after visiting Drayton Manor in Staffordshire earlier this week for a press launch of the newly expanded Thomas Land. You can find a full review of the park on our sister site Jaisee.com. This cake is easy to make and decorate -with step by step images. Perfect if you want to make your child’s cake yourself. To make the cake you will need 2 x 8inch cake tins (or the same one twice) and 1 x 6inch cake tin. The cake is crumb coated and filled with vanilla frosting. You will also need 1kg box white ready to roll fondant icing, 250g black ready to roll fondant icing and a red ribbon to decorate. 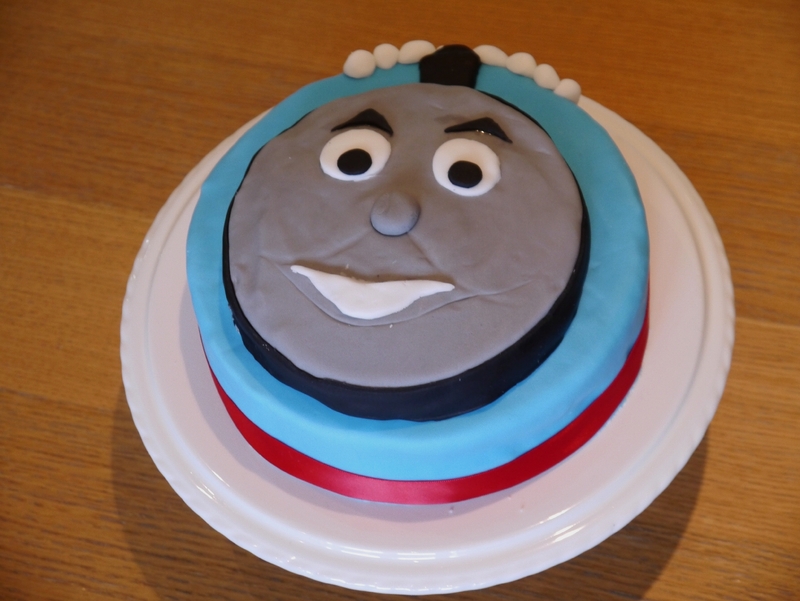 A simple chocolate cake recipe split between 2 x 8 inch tins and 1 x 6 inch tin to make a novelty Thomas the tank engine cake. Preheat the oven to 160c fan / 180c standard. Butter 2 x 8inch tins and 1 x 6 inch tin then line with grease-proof paper. Cream the softened butter and sugar in a freestanding mixer until pale and fluffy. Mix the vanilla essence into the beaten eggs and add little by little to the butter-cream while mixing on a slow speed. If the mixture starts to split add a spoonful of the flour to stabilise it. Stir the cocoa powder and flour together then add a spoonful at a time to the cake mix while mixing on a slow speed. Remove the bowl from the stand mixer and mix in whole milk a little at a time until the mixture falls easily from a spoon or spatula. Place roughly 1/5 of the mixture into the 6 inch tin and spread out until it touches the sides. Divide the remaining mixture between the two 8 inch tins. Bake all 3 cakes for between 15 - 20 minutes until a cake tester comes out clean - you may find the smaller cake bakes quicker. Turn out the cakes onto wire racks and leave to cool. Cream the softened butter and icing sugar in a freestanding mixer. Add the vanilla essence to the whole milk and add to the butter-cream. Mix on high for at least 5 minutes, Stopping the mixer occasionally to scrape the base and sides of the bowl with a spatula. Level the tops of the two 8 inch cakes with a bread knife or cake leveler. Sandwich the two 8 inch cakes together with the vanilla frosting. Use more vanilla frosting to cover the top and sides of the 8 inch cake as a "crumb coat"
Unless the 6 inch cake is very wonky do not level it as this gives Thomas' face a nice rounded look. Cover the 6 inch cake with a crumb coat of frosting. Colour approximately 500g of the ready to roll white icing with the blue gel colour - you will need a fair amount of colour to get a Thomas blue. Knead the icing to distribute the colour evenly throughout. Roll out the blue icing on a piece of grease-proof baking paper or a non-stick mat until it is wide enough to cover the top and sides of the 8 inch cake. Roll up the grease-proof paper / mat with the fondant on top and then unroll on top of the 8 inch cake so that the fondant is resting on the buttercream and down the sides and the mat / paper is on top (images below). Peel the paper / mat off the fondant and gently smooth the fondant into position, pushing gently into the sides of the cake. Use a pizza wheel or knife to remove the excess fondant from the base of the cake. Add a small amount of black fondant icing to approx 250 g of white fondant icing and knead together to make the grey for Thomas' face. Roll out in the same manner as for the 8 inch cakes and cover the single 6 inch cake with the grey fondant. Add a strip of black fondant around the edge of the 6 inch cake with the join at the top of the head where the funnel willl go. Use dabs of water to attach. 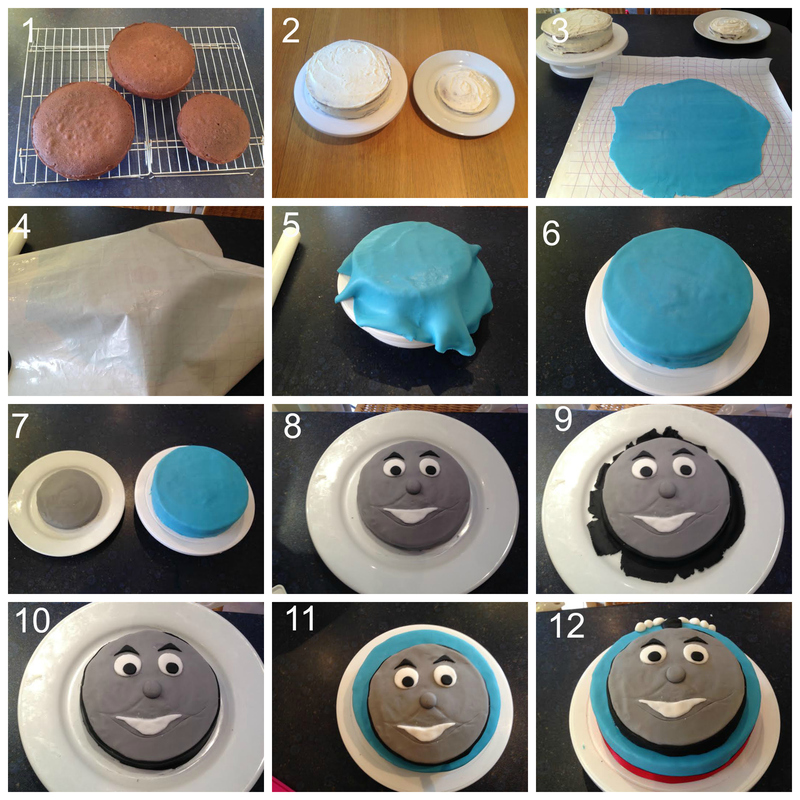 Use Black and white fondant to make Thomas' eyes and mouth then attach to the face using dabs of water. Use the handle of a spoon of a fondant modeling tool to gently mark lines on Thomas' face for his smiley cheeks. Place the 6 inch cake on top of the 8 inch cake with space at the top of the face to add the funnel and smoke. i.e. with a bigger gap above Thomas' face than below so the top cake is offset from the bottom one. Roll a cylinder of black fondant for the funnel then cut in half lengthways to give a flat base and place onto the 8 inch cake above Thomas' face. Make some balls of white fondant of varying sizes then cut each in half. Using water attach the flat side of these domes to the cake to make steam coming out of Thomas' funnel. Wrap a red ribbon around the base of the cake and secure with pins*. *Make sure the pins are removed before serving. Pizza wheels are ideal for removing excess fondant when covering cakes. Water is a free alternative to edible glue when attaching fondant details to cakes. My son would have loved this when he was young. It is really effective. often. I know that writing posts is time consuming and boring. But did you know that there is a tool that allows you to create new posts using existing content (from article directories or other pages from your niche)?